The hunting had been good for the last several days. It was a good omen, at least to True Edge�s way of thinking. His grandson was born. His daughter, now a new mother, had weathered that trial well, and now there was a new life in the Holt. Lost in the Now of wolf thought and the joy of the moment he didn�t see how things could get any better. Most of the tribe was asleep, but he had been restless. A couple of hours of hunting near to the Holt had yielded two rabbits and a fat quail which was more than he, Snowfall and Kestrel would eat at one sitting. Flush with his success he made up his mind to leave one of the rabbits for his daughter and Suddendusk. Thinking back, he could remember what those first few nights were like with a newborn cub. 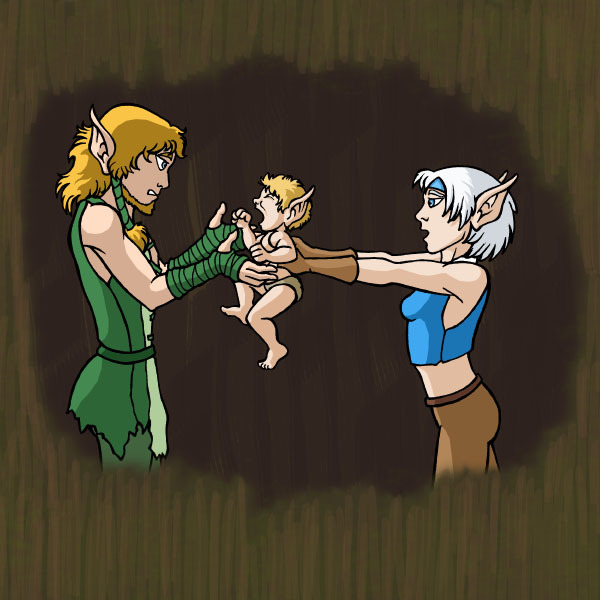 Rill was only about a hand of days old now, so it was still another hand's worth of days till he was officially introduced to the tribe. As likely as not, the new parents weren�t getting much sleep, nor eating as they ought to. A little extra food on hand surely couldn�t hurt. As he got closer to his daughter�s den all thoughts of approaching quietly so as not to wake them were shattered. Rill at least was awake, judging by the ear-splitting cries emanating from behind the hide door-covering. That was one part of having young children about that True Edge did not miss. Fortunately for him, Snowfall had always been so good with the children. She generally knew how to soothe their tears and still their cries. Even on the odd occasion when she didn�t know what was the matter, she had the gentle touch and good instinct to figure it out. Maybe he could just leave the rabbit by the doorway for them to find. Yes, that would be for the best. Then he could leave them to tend to the child in peace while he beat a hasty retreat. True Edge realized that though he was very skilled in many things, caring for a cranky cub wasn�t very high on the list. He could come visit later when Rill was in a better humor. The mental touch came as a bit of a surprise. He immediately realized that it was his daughter Quick Fang who had sent to him. Apparently her sensitive nose still managed to detect him despite her distraction. Now that they knew he was here he might as well go on in. Lifting the hide cover, True Edge stepped into the den. Quick Fang's voice was tight with frustration and fatigue as she thrust the cub into True Edge�s arms. He dropped his kills in surprise to take hold of his grandcub and looked towards his daughter with some surprise. True Edge looked down at the squalling cub in his arms and then towards his daughter. It was clear that she had gotten very little sleep and he remembered well the sudden mood shifts new mothers often went through. Suddenly though, another fact became apparent to him. Quick Fang began to pace about the small den as she talked. All the while, Rill continued his angry screams. High Ones, but how could something so small make such a racket? �Maybe your mother would be the better one to ask,� he offered. True Edge searched his memory for what little cub-lore Snowfall had managed to teach him. He was much better with them once they were a bit older, but there had to be something they could do. Rill was making himself sick from screaming and the den�s walls only muted his howls a little. Sooner or later the others would wake up and come to check on them. He held Rill up at arm's length and studied him for a moment. It seemed more of a pained cry than an angry or scared one. What had Snowfall done when their children had acted like this? Then, on a sudden inspiration, he laid Rill across his shoulder and began to gently pat his back. Quick Fang watched curiously as her father continued to gently pat and rub the cub's back. Then her eyes grew wide as a massive belch escaped from her tiny son. For a moment she was afraid that they had broken him and she rushed for a closer look. As True Edge lifted him from his shoulder, though, it was apparent from the look of relief on Rill�s face that he was now in a much better mood. A now much relieved Quick Fang retrieved her son and held him close. Rill, now over his belly ache and exhausted from his fit, relaxed into her embrace and began drifting off to sleep. True Edge watched her as she fretted over her son and a smile came to his face. The maternal instinct, it seemed, was there, only some of the specifics of how to care for a child eluded her. His mind went back over everything he understood about his willful, proud daughter and that sparked a realization within him. Quick Fang regarded him with a puzzled expression. Quick Fang stiffened a bit but didn�t turn away. He could tell she was thinking about what he said. Finally, after several long moments she finally spoke. He could see that she was thinking about what he had said but wasn�t really sure what to say. No matter, he was sure that she would come to the right decision. Gathering his things he prepared to go as she laid little Rill, now finally asleep, onto the furs. With that he left, leaving behind a quiet den and a bit of breakfast for his daughter.